It was originally coined "the glucose-sparing effect," but the whole point of sparing glucose in this context is sparing amino acids & protein. Because during starvation, if you kept up the rate of protein degradation to meet glucose needs via amino acid-gluconeogenesis you wouldn't last very long. Not just skeletal muscle protein, but heart muscle, diaphragm, organs, etc. This nice review highlights some of the new findings about the signalling effects of ketones but the title has led some to think the muscle-sparing properties of ketones during starvation carry over to making muscle hypertrophy gainz in the #context of nutritional ketosis. Here's what's up. During starvation, lipolysis exceeds peripheral fat-burning rates, so some of the fatty acids are partially oxidized in the liver to ketones. Ketones are the "fat-derived fuels," and when they get high enough in the blood, they will displace some glucose oxidation (thus "glucose-sparing). This spares amino acids directly, but ketones also lower hepatic glucose output and eventually inhibit lipolysis (to prevent fatty liver & potentially too high ketones). In nutritional ketosis, eg in that study on elite gymnasts, they nearly doubled protein intake and this had no effect on fat-free mass... not very muscle-sparing in that #context... but a ketone infusion in fasting people did help spare muscle in another study (caveat: that study didn't use proper controls, like an isocaloric glucose infusion or something). Starvation ketosis =/= nutritional ketosis. The mechanisms that help you not die during starvation don't quite apply when you're trying to optimize body composition. 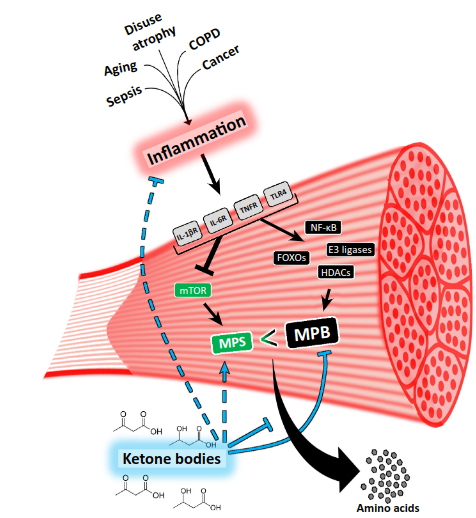 But the review article does highlight some other interesting aspects of ketones, such as modulating inflammation and gene expression, which may have other beneficial effects. Like if you have gout or certain neurological conditions. For personalized health consulting services: [email protected].